Lufthansa operates four versions of Airbus A340-300 airplanes. The first cabin version of Airbus A340-300 is most common version in Lufthansa. There are 279 seats divided into three classes on this airplane. Business class may transport 30 passengers on its 30angle-flat seats. The seats have 2-2-2 configuration. The seats of the first row are located close to the galleys and have no floor storage during take-off and landing. The only disadvantage of the seats of the 5th row is proximity of the galleys and lavatories. There are 28 standard seats in Premium Economy class. These seats are located in 4 rows per 7 seats in each. All of them are standard only the seats of the 10th row have some disadvantages such as: lack of floor storage during take-off and landing and close location of the galleys and lavatories. Economy class includes 221 standard seats divided into 2 section. Passengers of the seats of 16th row will take advantage of extra space for their legs due to the bulkhead position. However, as the tray tables are in the armrests, the width of these seats is reduced a little. Also, there is no floor storage for these seats during takeoff and landing. The main disadvantage of the seats of the 27th row is proximity of the lavatories as other passengers tend to gather in this area. The seats of the 29th row and the seats 30AC and 30HK have extra legroom thanks to the exit row in front. Among disadvantages of these seats: reduced width of the seats as the tray tables are built-in the armrests making them immovable, proximity of the lavatories and lack of floor storage during takeoff and landing. The seats 40D and 40G are standard but as there are no seats behind them other passengers passing by and crew members tend to bump into these seats. The seats 41DEG have limited legroom because of the misalignment with the row in front. The seats of the 46th row may be not reclining at all or less reclining. Also their close location to the galleys may be bothersome. The second version of Boeing 340-300 operated by Lufthansa may transport 251 passengers in three classes. Business class has 42 angle-flat seats located in 7 rows that are divided into 2 sections. First section includes 5 rows of the seats that have 2-2-2configuration. The main disadvantage of some seats of Business class is proximity of the galleys or/and lavatories. This disadvantage have seats of the 1st, 5th and 10th rows. Plus the seats of the 1st and 10th rows have no floor storage during take-off and landing. Premium Economy class includes 4 rows of seats per 7 seats in each (2-3-2 configuration). All the seats in this class are standard. Economy class may accommodate 181 passengers. It is divided into two sections. All the seats of the first section are standard only close location of the seats of 27th row to the lavatories may represent a problem. The second section of Economy class is located just behind the exit row. That is why passengers of the seats of 29th row and of the seats 30AC and 30HK will feel comfortable here thanks to the extra legroom. Among disadvantages of these seats: reduced width, lack of floor storage during takeoff and landing and other passengers tend to gather in this area in order to visit lavatories that are located close to these seats. As there are no seats behind, other passengers and crew members passing by tend to bump into the seats 40D and 40G. Because of the misalignment with the row in front passengers of the seats 41DEG may have limited legroom. The seats of the 46th row are considered bad seats as this is the last row in the airplane and that is why these seats may be less reclining or not reclining at all. Proximity of the galleys may be bothersome as well. The third version of Airbus A340-300 includes 298 seats divided into three classes. Business class consists of 3 rows of angle-flat seats that have 2-2-2 configuration. The main disadvantages of the seats 1CDGH is proximity of the galleys and lack of floor storage during takeoff and landing. Premium Economy class has 19 standard seats. The only disadvantage of the seats 6DEGH is close location of the galley. 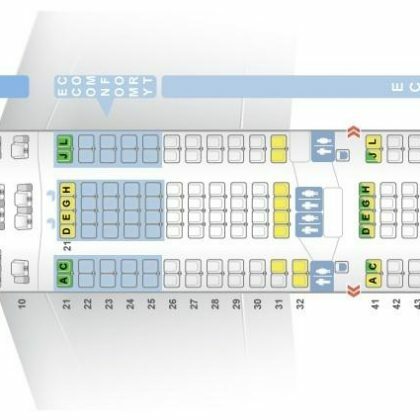 261 seats of the Economy Class are divided into 2 sections. The seats of the 11th row have extra space for passengers’ legs. However, the width of these seats is reduced a little, there is no floor storage for these seats during take-off and landing. Other passengers tend to gather here in order to visit lavatories and this fact may represent a problem. 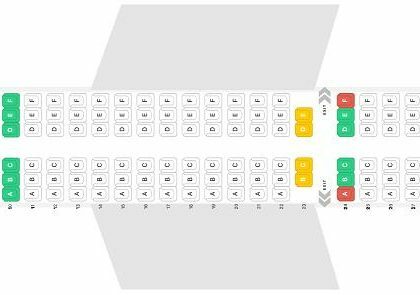 Due to the missing seats in front seats 12D and 12G have extra legroom but crew member and other passengers tend to bump into these seats. The seats of the 27th row are the seats that are located in the last row of the section that is why they may be less reclining. Close location to the lavatories may be bothersome. The second section of the Economy Class is located behind the exit row, that is why the first row of this section, i.e. the seats of the 29th row and the seats 30AC and 30HK have extra legroom. Among disadvantaged of these seats lack of floor storage during takeoff and landing, close location to the lavatories. As the tray tables are built-in the armrests they are immovable and this fact reduces the width of these seats. As there are no seats behind other passengers tend to bump into the seats 40D and 40G. The main disadvantage of the seats 45B, 45D, 45G and 45H is proximity of the galleys. The seats of the 46th row may have limited recline or may be not reclining at all. Also close location to the galleys may be bothersome. The fourth cabin version has 267 seats in 2 classes. Business class may transport 42 passengers on its angle-flat seats. 30 of these seats are located in the first section. Close location of the seats 1CDGH to the galleys may cause discomfort to passengers of these seats. The other 12 seats of the Business class are located in the second section. The seats of the 10th row have such a disadvantage as proximity of the lavatories and galleys. There are 225 seats in the Economy Class. Economy class is also divided into 2 section. All A, D, G, and K seats in the Economy Class have less underseat leg and storage space as compared to other standard seats because of the presence of entertainment equipment . Passengers of the seats of 15th row will take advantage of extra space for their legs due to the bulkhead position. The width of these seats is slightly reduced as the tray tables are in the armrests making them immovable. As there are no seats in front the seats 16D and 16G have extra legroom but other passengers tend to bump into these seats. Also these seats are a little narrower as the tray tables are built-in the armrests. The seats 26AC, 26HK and the seats of the 27th row may be less reclining as it is the last row in the section. Proximity of the lavatories may also be a problem. The seats 30A and 30K have less legroom due to the protrusion of the exit door into this area. As the tray tables are built-in the armrests, the width of these seats is reduced. Other passengers tend to congregate in this area to visit lavatories. Passengers of the seats of 29th row and of the seats 30C and 30H will feel comfortable thanks to the extra space for their legs. However, these seats are narrower than standard and due to the close location of the lavatories other passengers tend to gather here. Other passengers and crew members tend to bump into the seats 40D and 40G. The seats 41DEG have a little less legroom. The seats of the last 46th row may be less reclining and are considered bad seats.